Twin centuries to Narre South pair Jonty Jenner and Ashan Wijayakumara proved the catalyst for yet another dominant day for Narre South in Turf 2. Taking on Parkmore Pirates at home, the Lions won the toss and elected to bat, but the visitors got off to a strong start, ripping through the top order to leave them 3/44. Wijayakumara and Jenner came together and steadied the ship until tea, but rammed home the advantage in a stunning 215-run stand after the main break. Carving 22 fours and seven sixes between them (all off the blade of Jenner) the pair played contrasting, but extremely effective knocks, with Jenner the aggressor and Wijayakumara (101) the quiet accumulator, taking the score high into the 200s before the latter was eventually removed. Jenner continued on his merry way to finish on 161 – his third century since joining the club as an overseas recruit – before Scott Phillips (48) launched late to give the Lions 8/367 at stumps. St Brigid’s/St Louis, meanwhile, recovered from a torrid start to post an ominous 8/292, with a remarkable 70-ball 121 to Clinton Gottinger late in the day completely blowing away the Eagles. The home side elected to bat, and the Eagles made some terrific inroads into the middle, with Pardeep Boyal (3/30) and Sen Sathyajith (3/40) breaking through early to leave them 6/115, and eventually 7/128. But Gottinger, in a mindboggling partnership with lower order bat Ryan Malcolm (44), belted a 141-run stand for the eighth wicket to give the home side a decent platform to defend on Saturday. Dingley, and Narre North, meanwhile, are locked in a close battle at Souter Oval in a fascinating top-three battle. Off the back of an unbeaten 78 not out to skipper Corey Booth, the Dingoes made 194 on a spicy wicket, with Ryan Hendy (4/66) proving a hard obstacle for the home side. Calvin Barlow chimed in with a well-made 26. In what ended on a positive note, the Rams got to 0/52 at stumps, with in-form opening pair Josh Henry on 31 and Kyle Hardy 19. And Narre Warren seems destined for a crucial win against Dandenong West at Greaves Reserve after dominating the opening day’s play. The Magpies had a bat first and managed to claw their way to 191, with Dilusha Nanayakkara (59) and Imran Laghmani (59) striking half-centuries after a top-order stumble sparked by a terrific spell by Andrew Harry (3/30) causing them early strife. Veteran seamer Peter Atkinson was also impressive once again with 4/57 off his 18 overs. The Westers fought hard but were ultimately 5/69 at stumps off 30 overs, with John Mentiplay (3/18) doing plenty of early damage. Coomoora skipper Lance Baptist proved a difficult stumbling block for Beaconsfield’s bowlers during their Turf 3 clash at Perc Allison Oval. Striking a superb 124, Baptist led his side to a brilliant first innings total of 303 off 78.4 overs, with opener Rahoul Pankhania (52) also in the runs, combining for a 101-run stand with his skipper. Despite the best efforts of Baptist, Tigers’ bowlers Matt Golding (2/43), Jack Benbow (2/83) and Callan Tout (1/51) fought hard, while Jack Scott (3/5) got some late reward for his efforts. In what is going to be a fascinating second day, Fountain Gate and Silverton are dead even after the first day of action at Fotheringham Reserve. The Bakers batted first and recovered nicely from a string of early wickets off the back of Dale Weston (50) to post a competitive 119, with Dave Lucas (4/21), Rodni Kumara (3/44) and Aravind Muralidharan (3/36) doing a fine job with the ball. But despite a strong start in reply, the Gaters were remarkably bowled out for 119 too, with a stunning 6/52 to Michael Klonaridis getting the job done. At stumps, the Bakers are 1/6 off 3 overs, with a lead of just the six runs. Keysborough are in a strong position, meanwhile, against Parkfield at Rowley Allan Reserve. 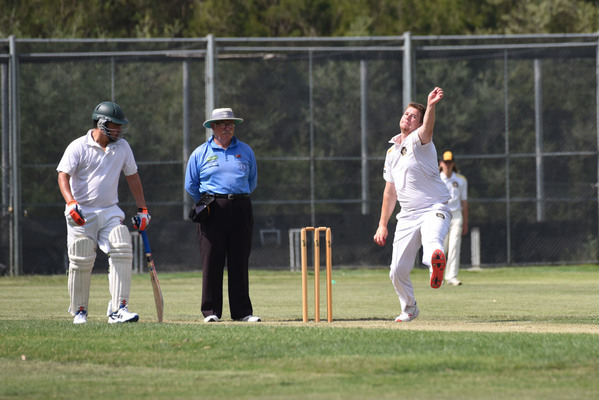 The Burras made 141 – a stunning recovery considering they were 6/26 – with a late charge by Amjad Farook (53) putting his side in a comfortable position. While the Bears are still 94-runs shy of victory, the home side made some inroads before stumps, restricting the visitors to 2/48 off 25 overs. And in the final match of the day, Lyndale (201) will fancy their chances of defeating Lynbrook (1/8) at Barry Powell Reserve after a strong opening day of cricket spared by an excellent 72 to Brendan Ash. Next articleHave you seen Bol?